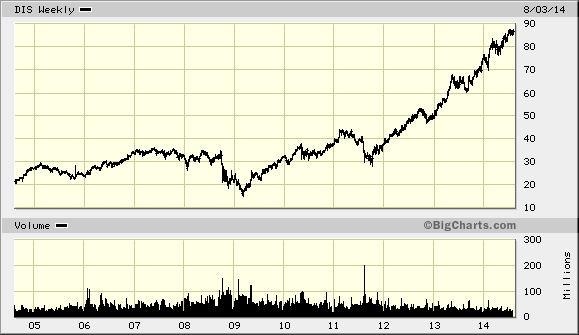 The Walt Disney Company (NYSE:DIS) operates as an entertainment company worldwide. The company operates in five segments: Media Networks, Parks and Resorts, Studio Entertainment, Consumer Products, and Interactive. The company is not a typical dividend growth stock, although it has paid dividends since 1957, and has never cut them. Disney is the type of company that raises dividends for a few years, then keeps them unchanged, after which it raises them again. Disney is also one of the 60 companies, which could be purchased commission-free using Loyal3, with as little as $10. The most recent dividend increase was in December 2013, when the Board of Directors approved a 14.70% increase in the annual dividend to 86 cents/share. The largest competitors for Disney include Time Warner (NYSE:TWX), Viacom (NYSE:VIA) and Twenty-First Century Fox (NASDAQ:FOXA). Over the past decade the stock has delivered an annualized total return of 14.60% to its shareholders. Future returns will be dependent on growth in earnings and dividend yields obtained by shareholders. 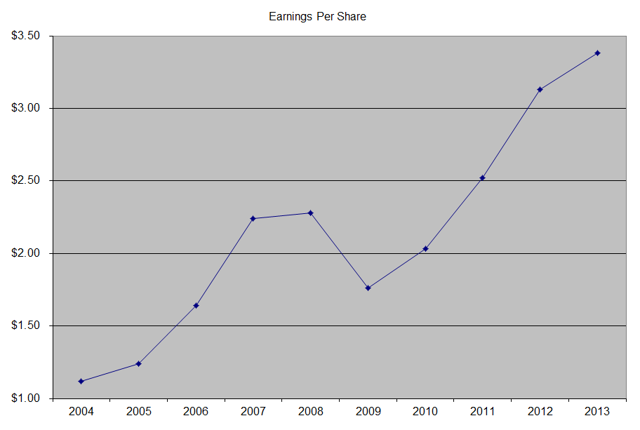 The company has managed to deliver a 17.90% average increase in annual EPS over the past decade. Disney is expected to earn $4.19 per share in 2014 and $4.63 per share in 2015. In comparison, the company earned $3.38/share in 2013. Between 2004 and 2014 The Walt Disney Company has been able to reduce the number of shares from 2.106 billion to 1.795 billion through consistent share buybacks. Media networks is the bread and butter segment for Disney, as it generates almost two-thirds of the company's profits. Disney has ESPN, which covers sports, and which are pretty popular. The dominant position in sports programming has allowed the company to earn affiliate fees from networks and advertising revenues. If you want to talk about sports in the office, you want to get the game and in-depth commentary from ESPN. The profits from this segment are futher reinvested on long-term rights for college and professional sport athletics programming. The company also owns Disney Channel and ABC Network. Disney Channel is one of the go-to places for programming for children, the other being competitor Nickelodeon. I generally view segments for theme parks & resorts, consumer products, and studio entertainment to be pretty intertwined. The company does offer a pretty diverse group of movies, and has been on a roll recently by unveiling a string of blockbusters. Those movies have as of recently generated close to 6% of profits for the company. It can then utilize characters from those movies in its theme parks, where people pay more each year to get in and have a family vacation. Those theme parks generate approximately 20% of company profits. Then, the company also earns 10% of earnings on consumer products which have those characters. I really like how the company has created its own ecosystem, where consumers see a movie, then go to a theme park to see characters from that movie, and then purchase products with the protagonists from those movies. The annual dividend payment has increased by 13.50% per year over the past decade, which is lower than the growth in EPS. Given the low payout ratio, I expect future dividend growth to average 10%-12%/year over the next decade. 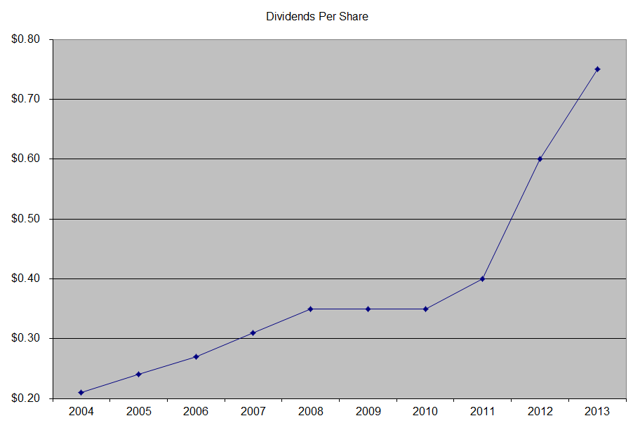 A 12% growth in distributions translates into the dividend payment doubling every five and a half years, on average. If we check the dividend history, going as far back as 1960, we could see that The Walt Disney Company has actually managed to double dividends almost every five and a half years, on average. 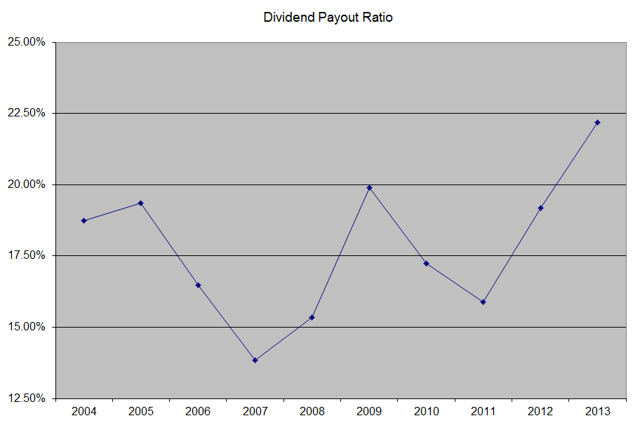 In the past decade, the dividend payout ratio increased slightly from 18.70% in 2004 to 22.20% in 2013. The company has a perennially low dividend payout ratio, as the rest of money is allocated to expand the media empire, and provide more dividends in the future. A lower payout is always a plus, since it leaves room for consistent dividend growth minimizing the impact of short-term fluctuations in earnings. 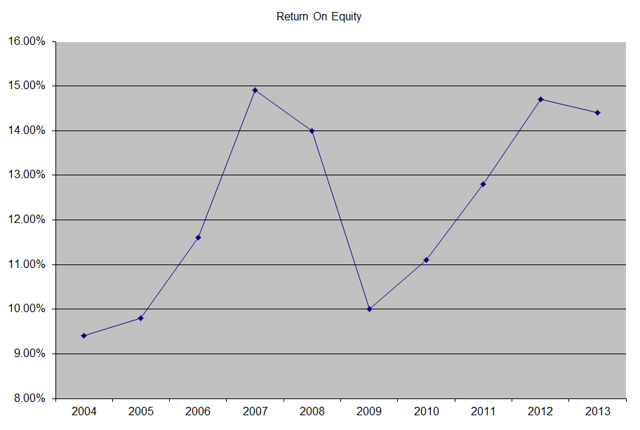 The return on equity increased from 9.40% in 2004 to 14.40% in 2013. I generally like seeing a high return on equity, which is also relatively stable over time. However, I was surprised that the company has managed to generate such a paltry return on equity. Currently, Disney is overvalued at 20.80 times forward earnings. The company will probably turn off many investors because it has a low yield of 1% and pays dividends once an year. However, I really like the company, and I believe it has a wide moat. I have hesitated initiating a position in the company for the past 20 points, because of irrelevant factors such as low yield, while ignoring the company's strong competitive position. I would feel more comfortable initiating a position in the company at lower prices, which is why I am going to be monitoring it closely. While the economics and prospects for the business are amazing, I do not like to overpay for even the best businesses, nor do I want to chase share prices higher. I would be most happy to initiate a position below $84 - $85/share. I would be even more ecstatic if I could purchase shares at 15 - 16 times earnings, which is equivalent to a dip below $70/share. If you have had the fortitude to purchase Disney, I believe this is the type of company to hold for decades, while quietly compounding your wealth and dividend income.